Walsh begins with the highest quality leather available, selected for optimum weight, grain and firmness. The craftsmanship of these halters is worthy of their reputation as the finest halters in the world. Customize the halter of your choice and add a name plate if you wish. We are also proud to offer any other Walsh products. Visit www.walshproducts.com to review their offerings. The 1" padded halter is made with the finest Havana or Black leather and padded with high end garment leather in the color of your choice. White fancy stitching on the nose and crown. Fittings in brass or stainless steel. Contact us for padding colors. An excellent halter for all your clipping needs. 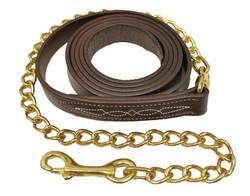 This 3/4" double stitched, straight chin halter combines the classic halter look with functionality. Available in Chestnut or Havana with white stitching. Sizes are Medium Pony, Cob, Horse, and Oversized. Walsh's #1 selling halter is the British Halter. This 1" halter is triple stitched with a straight chin and solid brass fittings and your choice of a snap or solid throat latch. Choose from Chestnut or Havana with white or brown stitching or Black leather with black stitching. This is simply the finest quality shipping halter on the market. 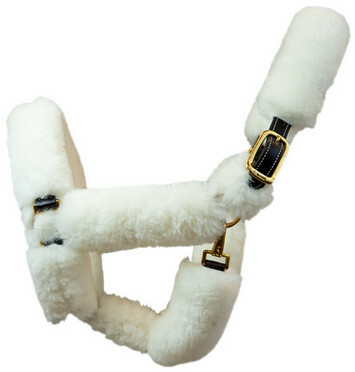 Genuine Bright White sheepskin is hand-sewn onto each of the 1" Havana double stitched halters. Keep your horse comfortable and protected from rubs while in transit. 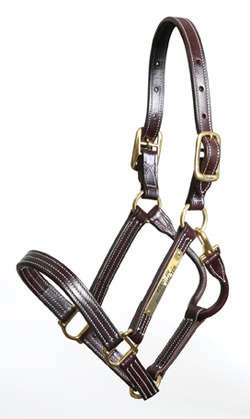 Walsh leads are a perfect compliment to your Walsh halter. Choose from Chestnut, Havana with white stitching or Black leather with black stitching. You may also choose brass or stainless chain in 24" or 30" lengths. You may also wish to consider the jumper lead - the split chains is a perfect choice for waiting ringside, or the leadline class.